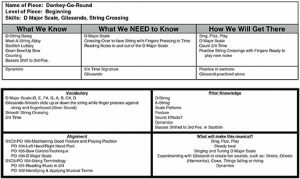 String Riffs concept maps are invaluable information-rich tools for teachers, and they’re included for each piece in every volume. Take a look at the sample below (from “Donkey-Go-Round” in String Riffs: Volume Two), and you’ll find clearly labeled sections based on students’ existing skills and future objectives, and suggestions to help achieve those goals. String Riffs Hootenannies are the best kind of music party — you’ll have the opportunity to play and hear many of our original studio and string orchestra compositions with fellow musicians in a reading session. Pros enjoy playing, audiences enjoy listening, and kids enjoy practicing these pieces! No pressure, just an introduction! Don’t miss this fun opportunity to preview great tunes – get in touch with Karen Koger directly through our “Contact” page to schedule your Hootenanny. Didn’t find the answer to your question here? Feel free to use the “Contact” page.